OJT.com – Your First Stop for 2026 Training and Career Opportunities to assess the most opportunistic areas for training providers and occupation seekers in the 2026 timeframe. Our analysis of industry data shows you the industries with the steepest growth trajectory in each state and the industries with the steepest growth trajectory, relative to their peer industries, in an industry group. Figure 1 provides a typical state chart that shows the percentage of all sectors employ relative to the percentage of those sectors employ in the country at large. 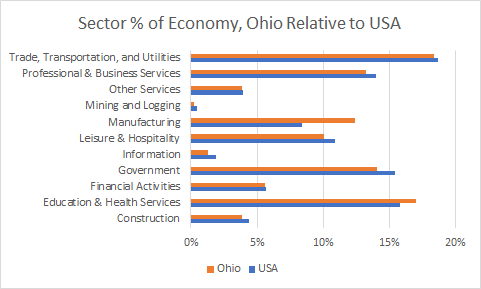 From the chart, it is apparent that Ohio is a hotbed for Manufacturing. Figure 2 shows the growth of the sectors, over the year from June 2016 to June 2017. 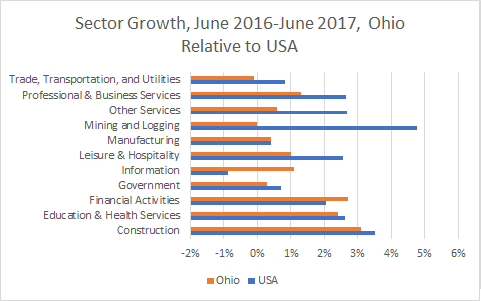 The growth picture indicates that Ohio looks like it may become a hotbed for the Information sector. Software programming is an industry in the Information sector and I suspect this is where much of the growth is coming from. If I were a training provider or career seeker in the Manufacturing or Information space, I’d definitely give Ohio a closer look. I’d also go to the Manufacturing and Information industry pages, on OJT.com, to drill into these sectors to see which subsectors provide the most opportunity. Figure 3 shows the expected growth for each of the main industrial sectors, relative to the size of that sector in the overall economy. The average growth rate across all sectors is 5.8%. Anything larger than that indicates an expanding sector and anything less than that indicates a shrinking sector, relative to the other sectors in the economy. The Health Care and Social Assistance sector indicates a remarkable amount of growth. To find out where most of this growth is coming from, I’d go to the detailed industry page for this sector. 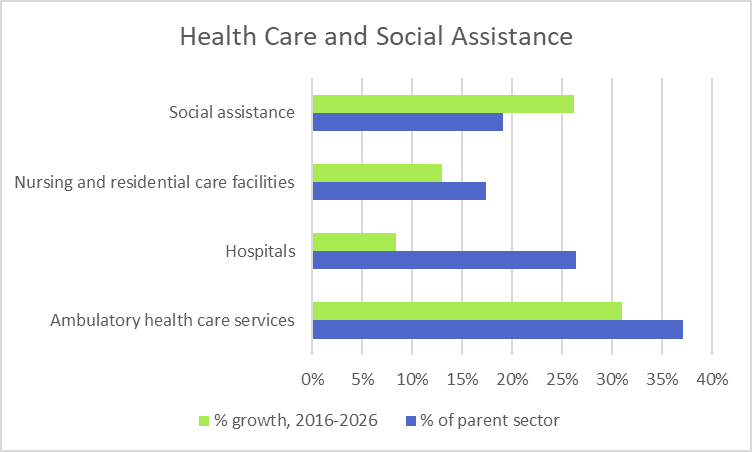 Figure 4 shows the chart for growth within the Health Care and Social Assistance sector. Ambulatory Health Care Services and Social Assistance appear to be the two main drivers of growth in this sector. 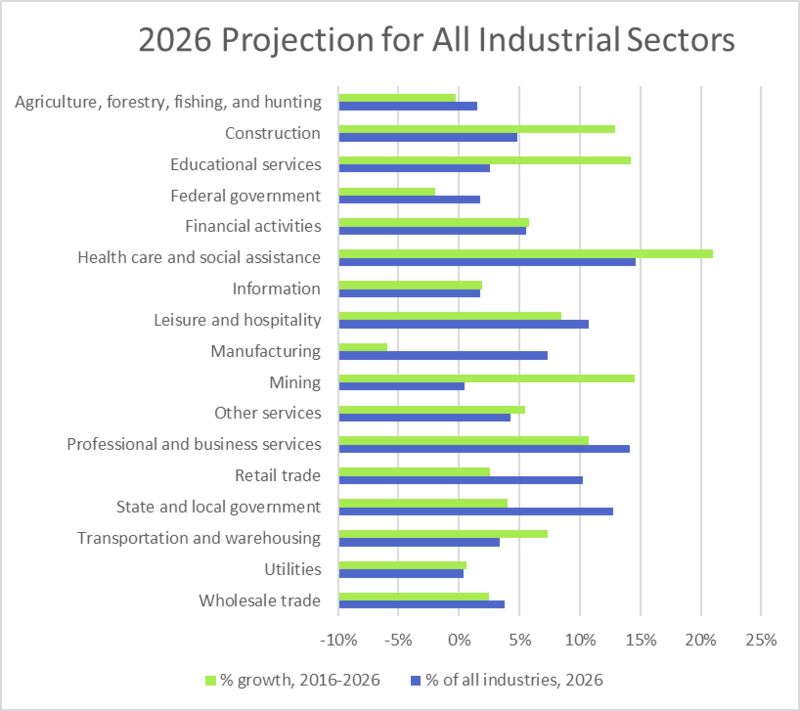 Within each industry and industry group, we highlight the 10 largest projected occupations and the 10 occupations with the steepest growth trajectory. Sticking with Ambulatory Health Care Services, Table 1 and Table 2 show the largest and fastest growing occupations in this industry, along with the related educational and OJT requirements. If I had any interest in this field, targeting these occupations would make a lot of sense. In conclusion, training providers can use our industry information to assess future-looking demand for on-the-job training programs. Occupation seekers can this information to plan their careers and to seek out the on-the-job training required for the highest in-demand occupations in the near future. Training providers and occupation seekers can use the state data to see in which state it makes the most sense to focus their efforts. Career seekers trust OJT.com to find their career for the future. This entry was posted in Promotion and tagged Apprentiships in America, Corprate America offering Internships, Fill the Jobs Skills Gap, OJT, On-The-Job Training, Training for the Future.